Mexican boxer Juan Jimenez was brutally knocked out by Arthur Villanueva of the Philippines yesterday September 24, 2016 in Carson California USA. 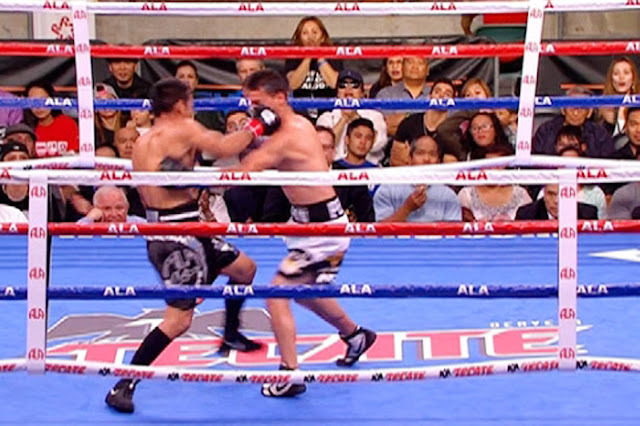 Villanueva from the Philippines connects a brutal solid right hook that puts down Juan Jimenez in round 2. Jimenez was badly hurt and wasn't able to continue. Arthur Villanueva said in the interview: "Hindi po ako nage-expect na ganoon kabilis matapos ang laban. Sinunod ko lang po ang instruction ng coaches ko," "Pinag-aralan ko ng mabuti ang last fight namin." Villanueva successfully defended his WBO Asia Pacific bantamweight title and improved his record to 30W(16KO)-1L while the Mexican dropped his record to 22W(15KO)-11L. Villanueva is currently no.1 WBO contender but the title is held by the Filipino Marlon Tapales.